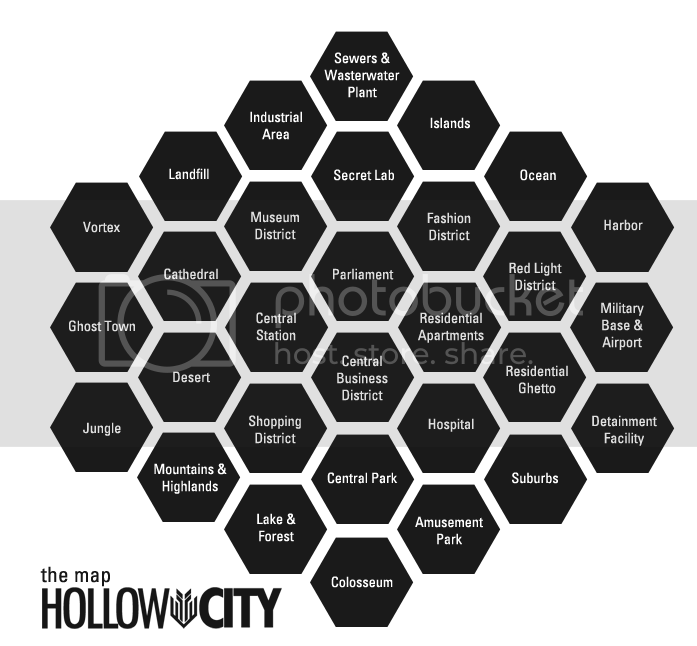 Hollow City • View topic - The new Map! I added the Vortex, as a mysterious/supernatural location. Anything can happen here, be it Space, Xen, Anteverse, Nightmare or alternate reality. I guess battles taking place here can at any moment turn non-canon. The second location I added is the Landfill, which includes Junkyards, Waste Plants, and maybe Ruins of War (?). This one is definitely up for discussion. Green is Nature-Based, Blue is Upper Class, Red is Lower-Class and Grey is Industrial. Each Player is assigned a random location at the beginning. He can fight in this location and all 6 locations surrounding it, if an enemy agrees to fight him. Alternatively, he can challenge his enemy and let him decide the battle location - which must be enemy's location or surrounding fields. The winner of the battle can choose any location on the map to move himself to. The loser stays in or moves to the field where the fight took place. CN and Kensington are assigned the locations Landfill and Hospital respectively. CN can fight in the locations Landfill, Vortex, Cathedral, Museum and Industrial Area. Kensington can fight in the locations Hospital, Suburbs, Amusement Park, Central Park, Central Business District, Residential Apartments and Residential Ghetto. CN and Kensington can agree to fight each other in any of those locations. If Kensington challenges CN, he can choose any location around him (Landfill, Vortex, Cathedral, Museum or Industrial Area). The choice of location is his. For example, he might choose the Vortex. If Kensington were to win the fight here, she can move to any field on the map she wants to. CN would remain in the Vortex for now. Glad to see that Jonaston is still viable. XD Not sure if I'll be bringing Hazmatt back, or even how active I can be. But I'm glad to see that this is progressing well! I like the proposed movement system, Ein! Gives the map more purpose. Wouldn't it be a thrilling feature to let a victorious player take control of the field the battle took place? He would be rewarded with bonus points for conquering it and extra points for every battle the player can hold the field. And: Every player who can beat the king of the hill also gets extra points (he has no responsibility to take control of the field himself, if he doesn't want it. It would just become neutral again). With few points for the outer fields and lower-class fields and high point rewards for conquering upper-class fields. That could be a motivation to get the players to engage in more energizing combats. Like Championshipbelts in ProWrestling: Everyone wants to be the champ but there can only be one at a time. If two players just want to fight with no ambitions to seize control over parts of the city they don't have to. They even could fight like normal on a player-controlled field as long as they don't challenge the current fieldowner. Battles for supremacy should include the struggle over the territory storywise (Like the character is a mobster and takes control over the drug-biz in the fashiondistrict or he is a mage and wants to use the lifeforce of the unknowing patients of the hospital for his dark rituals if he can conquer that field or a militant anarchist who will burn the suburbs to the ground if he isn't stopped by a lawful character etc.). 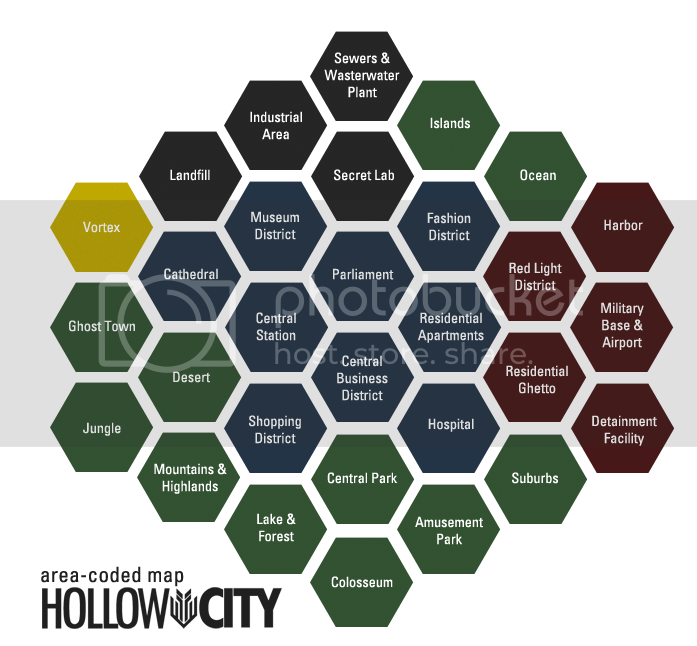 The Wiki could keep track on who is owning certain areas and what happens to that places under the characters rule (the player should of course provide that information under the watchful eye of the mods). This would create a dynamic feeling of a city in constant change and turmoil and conflict. It could even create the possibility to form player-created-factions who could reign multiple fields at once and share the points they earn. In he end it would just be ben ruling everything, but you know... it could be fun 'til then. I like Frost's idea, it seems silly to have all these awesome places to battle, a fancy map and a huge "city" with a (probably) awesome backstory and not use everything to its fullest. Part of the draw of the original WFA was that it was a WAR whilst most people focused on their own characters and how to tell their story for the most part, there was always a sense of everything being a part of an overarching plot and scheme. Though obviously you guys are still hard at work on this new concept, i don't see how, without the "war" and the territory control, you can have epics like the "season finales" we had before? Feel free to let point me to anything you guys already have posted that i may have pointed out wasn't around yet, still not read in depth in every forum yet. With the current number of players there wouldn't be much of a "big finale" even if we staged it. If we ever have 30+ players again we can easily come up with plots to do something big, or people can build up stories that lead to that. Frost: I see your point but I think it would be boring for the players to fight in the same location 5 times in a row. And there's the danger that everyone would just sit in their spot and not move away because it gives them extra points. We would like to keep the battles simple and this would complicate things. We would like to encourage people to explore the map and try out different locations, even those they would normally not fight in. If someone wants to defent their own "turf" they can try and do so. We have prepared achievements for different scenarios and events and who knows, maybe you'll get one if you do a certain thing or win a certain number in a row. You will get extra points for winning, so you are automatically in the lead anyway if you never lose. Five wrote: With the current number of players there wouldn't be much of a "big finale" even if we staged it. If we ever have 30+ players again we can easily come up with plots to do something big, or people can build up stories that lead to that. Yeah, when I first came on WFA, there were a decent amount of players but as time went by, we just...kinda lost a lot of people mostly due to being so busy with their personal lives. It would've been nice if we did have some kind of wrap up for the end of the war before hopping onto Hollow City. But I suppose what happened, happened. We'll just have to do our absolute best and incooperate what happened during the end of the war and the time line between it in our intro comics and even possibly during the first battles, just like what Ein and Five proposed in the first place. I agree with Five. It also might get a little confusing if we try it that way. It's a interesting concept you thought up though! Also on the plus side with what Five added about exploring new areas it'll give the artists a great chance to really think up the designs for those new areas for their next battle(s). "Care for a cup of tea?"